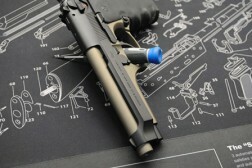 We post many of the firearms we've coated in this section, we're always working on something new. 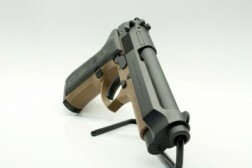 These are firearms we have done for Customers and for our own Collection. If you would like to know more about any of these firearms feel free to Contact Us anytime. 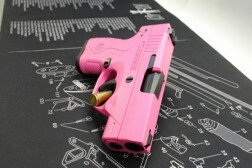 Only the firearms with prices next to them are from our sales section and are available for purchase. Click on photos to see more Information and a larger View. 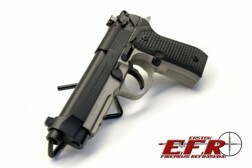 This one was refinished in EFR Black and a custom bronze cerakote . 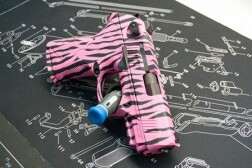 We added brand new grips to finish it off . Went up for sale online and did not last a week. It was a very nice shooter. 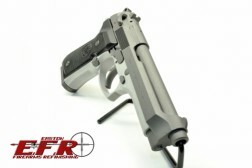 The frame was refinished in a custom Stainless steel cerakote color. 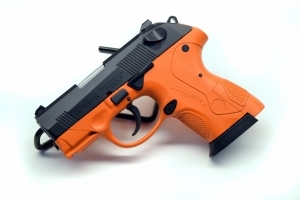 The frame was refinished in safety orange cerakote. 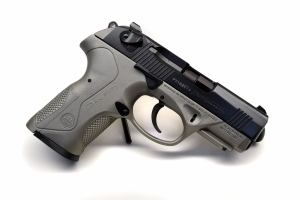 This is our preferred type of Beretta, It has removable front sights so it's much easier to refinish. It's still a little bulky and with the rail even more so, but it makes for a great nightstand pistol. 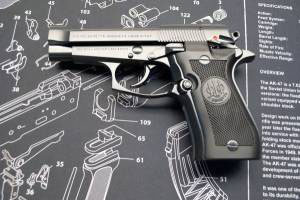 This is a Police Trade In Beretta we refinished for one of our best customers. It pretty much looks brand new after refinishing, We should have taken some before pictures of the holster wear. 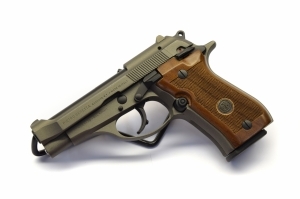 This Beretta was formerly in service with a police department and the finish was heavily worn. It now wears a nice 2 tone Graphite Black and Troy Coyote Tan Finish. This little gun is pretty simple in design. Which for a CCW is a good thing. Remove the rear cover and the extractor, striker, etc come right out. 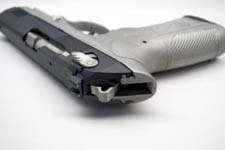 The front and rear sights are held in by simple hex screws and slide right out. The frame is the hard part, Everything needs to be held just right to get it back together. Overall though, It's a solid pocket pistol. This one was done in a Graphite Black / Modified Burnt Bronze combo. The The burnt bronze was lightened to give a unique look the customer wanted. 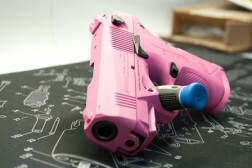 If you have a color in mind not on the cerakote charts let us know and we might be able to mix it for you. We coated this one in all silver, It's not overly shiny like some stainless and or chromed funs though. It came out pretty good. This one was done in a Pink and black tiger style pattern for a female armed forces member returning home from the war zone, she wanted something on the wilder side. Thank you for your service. This is a partway finished Beretta we're doing. 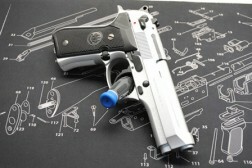 This pistol was refinished in midnight blue cerakote. Nice concealed carry pistol with a decent mag capcity. The frame and barrel were refinished in Coyote Tan Cerakote. 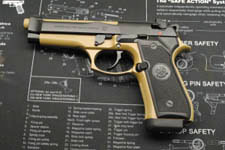 This is my Son's Beretta, We coated it in a two tone for him last year. This pistol is unique in that the barrel rotates while the slide pulls back after each shot. For Dealers, Gunsmiths, and High Volume Customers we offer 10% to 20% volume pricing discounts, Please Contact Us for more information.